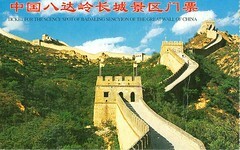 This is the ticket for the scenic spot of Badaling Section of the Great Wall of China. There is a saying, 'he who has never been to the Great Wall is not a true man.' Chang visited Chen in Beijing and went to the Great Wall together during Christmas holidays. Here is the evidence.